Modern leadership courses have helped to ensure no one can argue that organisations have “off the charts” productivity when compared to our ancestors. Management and Leadership techniques have come a long way in the last few hundred years, and now you can learn what the best management courses and scientific management research has discovered. Have you ever stopped to think about what it would be like to get a competitive advantage over others in your industry? Now there are management training courses that can give you that advantage. In this management course we’ve cherry picked the best tips and techniques from all our management courses and put them into one article. Lots of people have tried to do this. Over the years humans have improved and built on previous systems and processes and developed super slick organisations that achieve amazing things that our predecessors couldn’t have dreamed of. But, for all our advancements in technology and our developments of systems and processes, we still have one area which, in many organisations, is only operating at a fraction of it’s true potential. Got a delay in getting something done? – Somebody not done something they were supposed to do? Got an issue with the standard of work not being good enough? – Someone not very good at their job? 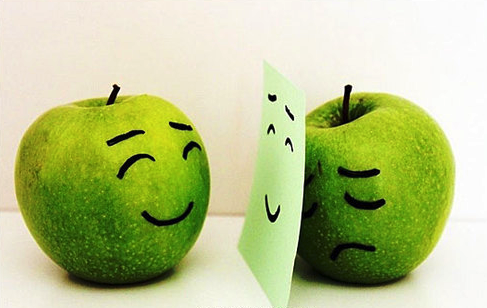 Got let down – Someone who doesn’t care? Got a great idea that will make a positive difference? – Maybe an over controlling boss won’t let you do what you want to do? This list is far from complete but you get the idea. People can (and often do) drive other people crazy! 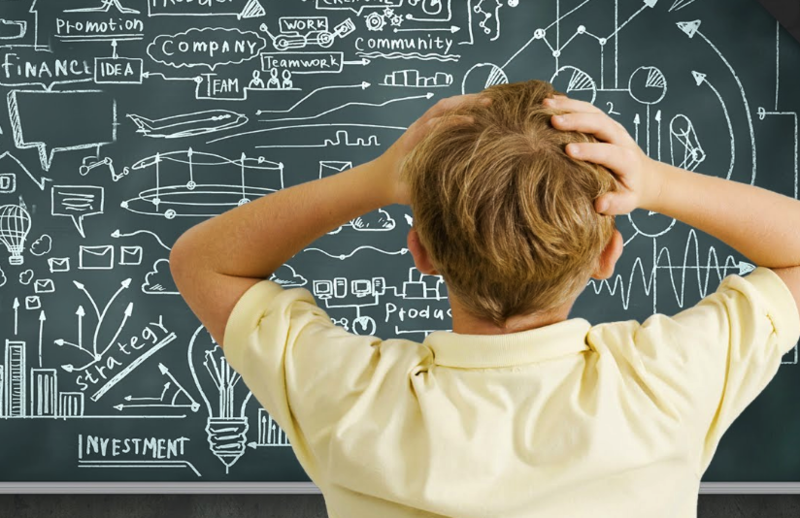 One of the biggest problems with being a Manager or Leader nowadays is not a lack of information, but is actually information overload. It’s hard to know when you have the best technique or method. The problem is that there are a lot of good management courses. Often these leadership training courses have good content. It sounds good and it makes sense and lot’s of it sounds very clever. Nowadays things are a lot more competitive than they used to be. 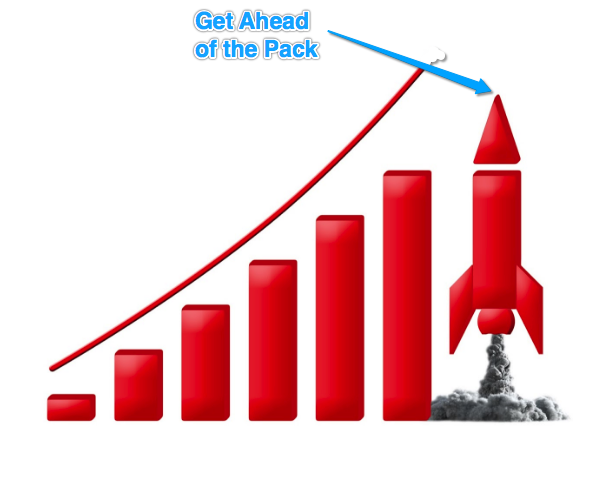 If you want to get ahead of the pack a good management training course isn’t enough. You need to spend your time focusing on THE BEST leadership and management courses. 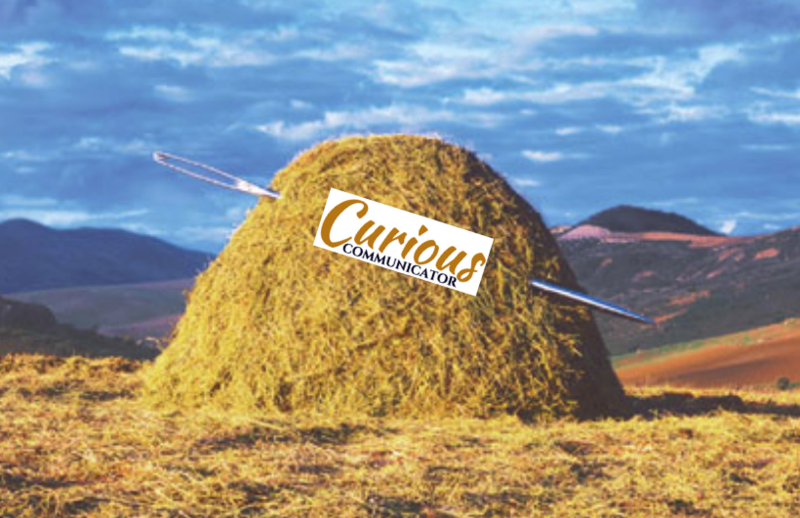 Sifting through all those haystacks and finding the best needles is hard work though, so we’ve made it nice and easy for you by collating the best of what we’ve seen into this free online management training course. Each of the topics covered is key to long term successful management and leadership. There are 3 management courses that make up this leadership training course. Of all the leadership courses we’ve produced this is by far the most in depth and detailed. I’ll be really honest with you, when I first became a manager, one of the most difficult things I had to overcome was getting through to unmotivated team members. With little training and no experience at all, I found myself in the same position as a lot of other new managers do, I had to work really hard to cover their shortfalls. I spent less time managing and more time making sure I filled in the gaps that my team were supposed to be filling, by being the hardest working one there. Looking back, I can clearly see I was doing their job for them! Ever get the feeling some members of your team know how to do just enough to get by? 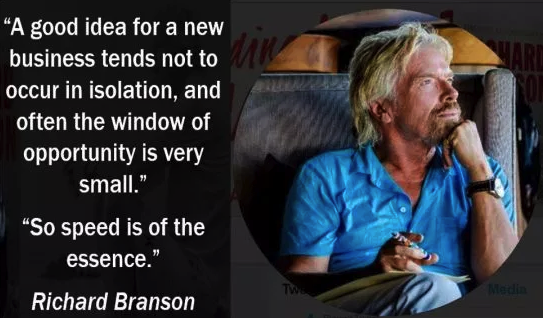 For me this meant my work as a manager, although deemed to be acceptable by the company, was actually me working at a pretty low level in comparison to my potential. Although I was getting the job done it definitely wasn’t the way I wanted it to be. This was a serious problem for me. I had worked hard to get on, but the reality of my promotion was just starting to sink in. It simply meant I worked harder than everyone else while being held accountable for unmotivated employee failures, and it kinda sucked! Likely similar to you, I found myself working with a group of people that I liked (even if the lack of performance of some was frustrating). I knew they were capable of much more than they were currently giving, the problem was a lack of motivation. I just didn’t understand what I needed to do or how to motivate a team. 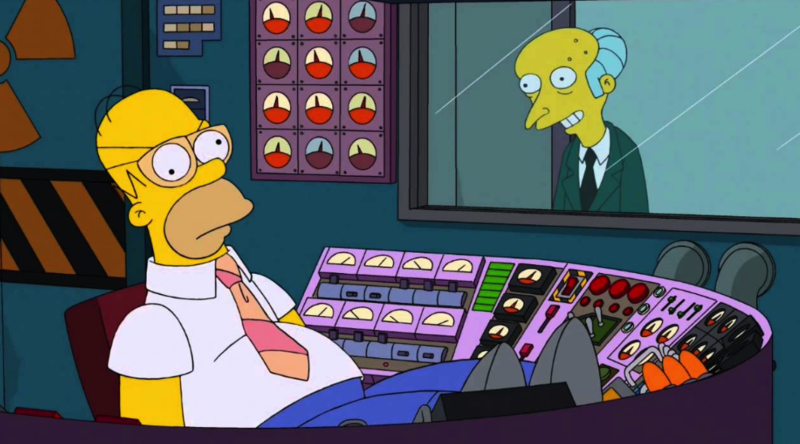 I knew my job would get a lot easier and my team would get a lot better if I could work out how to motivate unmotivated team members. The solution to this problem actually came to me by accident when I did a course on presenting. At the time I thought they spent a bizarrely long period of time, discussing how the brain works and explaining the key difference between what happens in your brain when someone listens to you during a presentation vs someone that does not pay attention. 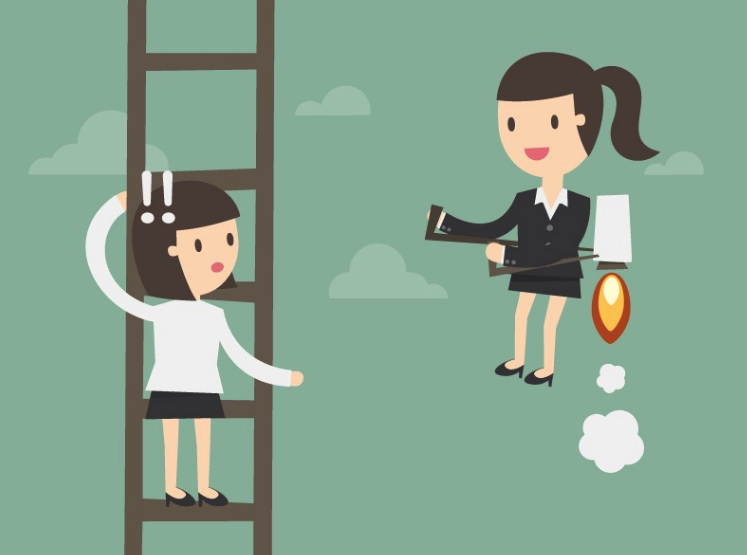 The truth about this employee motivation is surprising and extremely useful to know. Let’s see what motivates people? In psychology, there is a long-standing principle called the “Pleasure Principle”. This principle dictates that all human beings will have the instinct to seek pleasure and avoid pain. 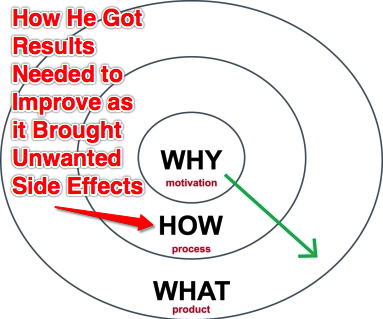 Essentially this is the driving force that causes people to take action, otherwise known as motivation. If you want to improve your skills to motivate a team, you need to understand the different ways people are motivated. You are good at Maths and because of this, you enjoy it. You feel secure your knowledge is good on this topic and you feel proud when you get an answer right that no one else knows. You love feeling smart so you continue to work hard and practice, so you can continue feeling the same way. (Motivated to continue the good feeling. Seeking of pleasure or a desire for the good feeling to continue). You hate Maths, but your parents take a keen interest in your grades. You’ve never failed anything before and you’d be super embarrassed if you were to get a bad result in your Maths test. So you study long and you study hard! (Motivation to avoid the pain of embarrassment). 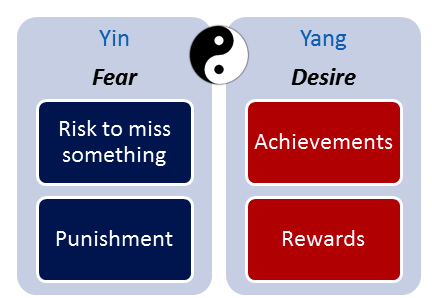 In both examples, the end result is the same and the actions taken by both students are the same, in that they both study hard. But the way that each person was motivated was totally different. The example above is an emotional pain or pleasure, but this principle would translate to any type of pain or pleasure. For example, the water is scalding hot and burning my hand so I’ll move my hand away from the hot water (avoid physical pain or fear of long term damage to your hand). This is only part of the picture though, to get a better understanding of how to motivate people we have to delve into the physical structure of the brain itself. Have you ever thought about the journey communication takes from one person to another? Understanding how information is processed by the different parts of the brain will help you better code your message and make it more motivational to your employees. If you want to motivate people so they do something the first time you ask, you need to be crystal clear on how information passes from one person’s brain (yours) to another (theirs). our brains cannot physically store that much information. 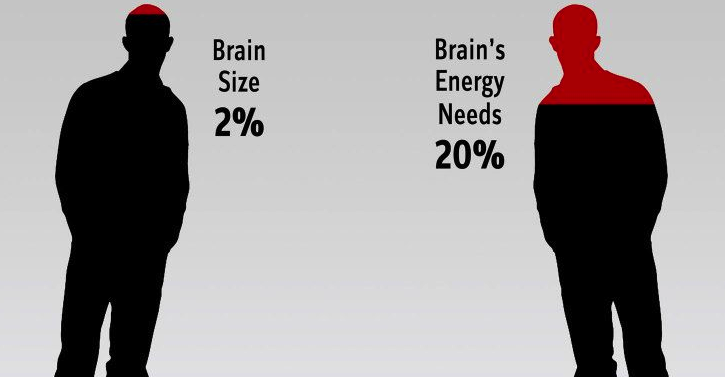 The human brain accounts for only 2% of the mass of a typical human body but it uses approximately 20% of the energy. Energy saving measures have had to evolve to keep this resource-hungry organ in check, the brain has evolved into an extremely efficient energy saving machine. 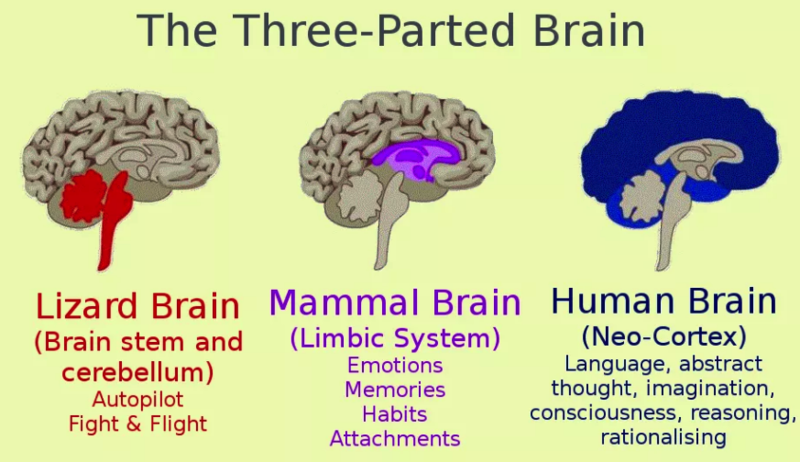 To better understand what’s happening we need to look at the anatomy of the human brain and look into how each section functions with regard to incoming information. This investment in knowledge will pay off for many years to come, it will have a massive positive impact on your ability to execute motivational strategies in the workplace, or anywhere for that matter! The brain has evolved over millions of years, it started with the bottom section of the brain and then as demands increased, further upgrades and bolt-ons have evolved to meet the requirements of modern living. We will go through the other sections of the brain and what they do but first, let’s look at the oldest part of the brain. 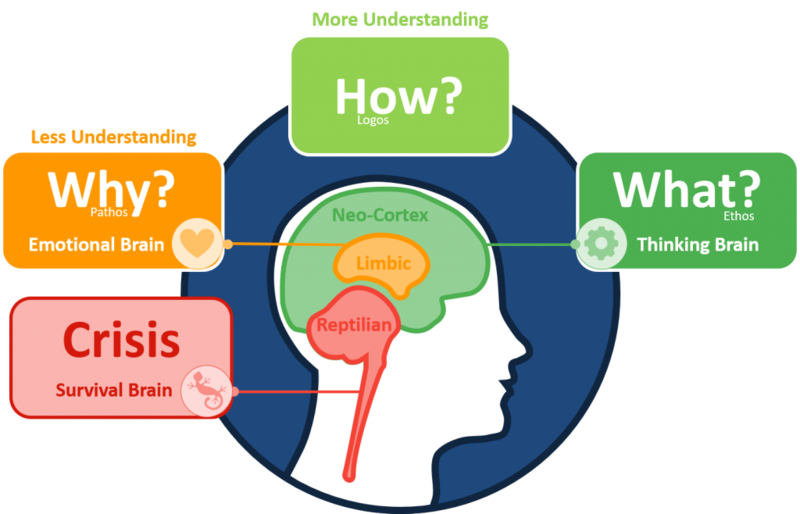 This is often referred to as the “Lizard Brain” or “Reptilian Brain” or “Croc Brain”. It’s been around for approximately 500 million years! That’s a long time and explains the reason why it has become so ruthlessly efficient at what it does. If you’ve heard of the saying fight or flight, then you already know a bit about what this part of the brain does, but it isn’t all it does. 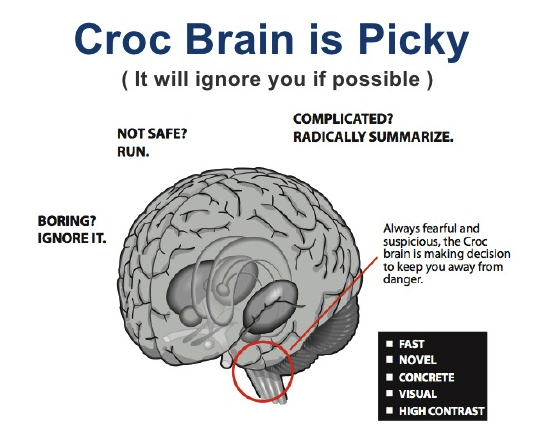 The Lizard Brain (or Croc Brain) is an extremely powerful part of the brain. It developed in a prehistoric world where one misjudgement or mistake could mean you were doomed. It developed an automated response to fear anything that could be a threat to your survival. This is all very interesting, but how does this translate to the modern world, and in particular how does it process information today? 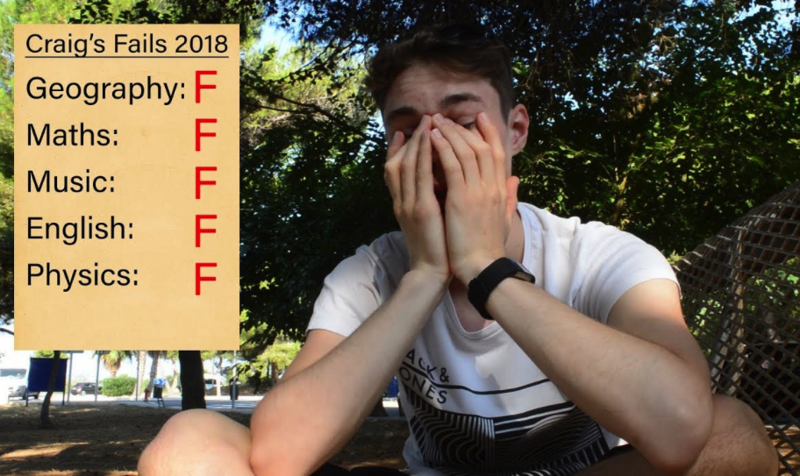 To answer the first question, we can go back and look at the example above with the student that studied hard for his test through fear of embarrassment of getting a bad grade. Using this example it becomes easy to see how in modern times where the threat to our lives is practically non-existent, the Lizard Brain takes over to protect us from other types of danger, such as the emotional trauma of the embarrassment of a failed Maths test. This helps explain people’s sometimes irrational behaviour. It isn’t life threatening but people sometimes act as if these types of situations are! 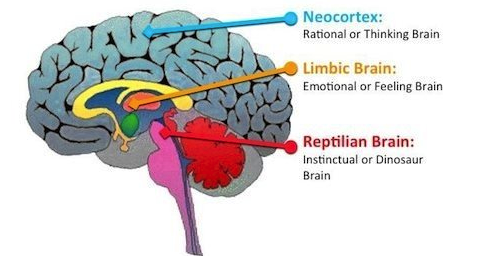 The lizard brain can be extremely difficult to get your message past, in short this is the reason so many leaders and managers fail to motivate their teams. Once you have a better handle on why people do what they do (or don’t do) you can focus on learning what the rest of the brain does. Neuroscience has offered many important insights into the function of the brain. Some of the best communicators I have worked with have a fantastic understanding of how the brain processes information and have been able to use this to seriously improve the speed they can get results, often achieving results that others could only dream of. When it comes to solving the problem of how to motivate people, skilled communicators have a clear head start in the game. Have you ever wondered why people don’t listen to you? Well, it may not be their fault. The diagram above shows how the Lizard Brain processes information; it is a ruthless filter always on alert trying to ignore information. Almost all information is ignored with the exception of only new or interesting information, unless there is danger in which case the automatic fight or flight response kicks in. 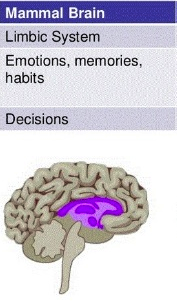 Other than the flight or fight responses, any decisions must be made by different parts of the brain. This is why most of your message often doesn’t motivate people to change, it never made it to a decision making part of the brain. For the small percentage of information that does make it past the filtering process of the Lizard Brain, the journey is far from complete. 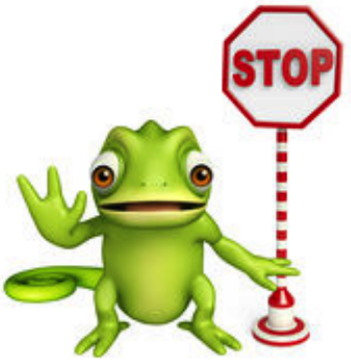 There are ways to ensure your message makes its way past the Lizard Brain and from an influence point of view you have to be able to get your message into the decision making part of the brain, or people will not be able to make a decision to change! 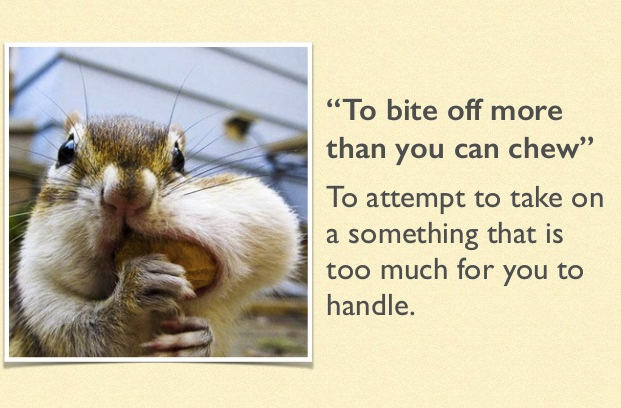 So this is a big problem to have to overcome as a communicator. It is for this reason that the Lizard Brain is sometimes called the “Gatekeeper of the Brain”. Let’s assume you’ve been successful and your message has made it past the lizard brain. The message has been deemed either interesting or new so it has been now being forwarded to the next part of the brain. 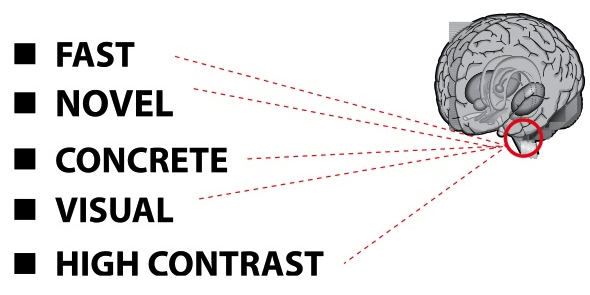 As the brain evolved from the bottom up, this is also how the information travels through the brain. Which brings us to the……. The middle section of the brain is often referred to as the monkey brain or mammal brain. The mammal brain is responsible for our emotions, feelings and the creation of memories. It has also been around a long time – an estimated 150 million years. This is an important part of the brain to be aware of when interacting with others. There’s no point in getting your message through if it makes the person feel bad or uncomfortable. It might get you a result on the day but in the long term, people do not want to work with those that affect them negatively. 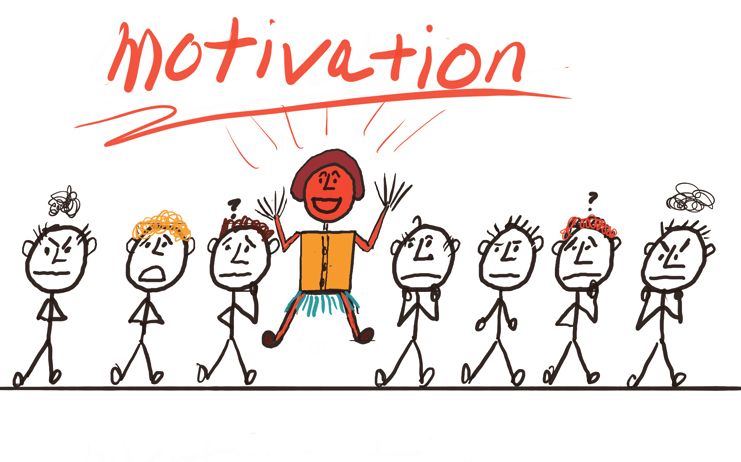 Why is making people feel bad in order to motivate them not what organisations want? Mediocre communicators, by comparison, will get the message through but ignore or don’t value the importance that this part of the brain plays, and this can prove disastrous to their long-term success. You getting the results you want at the cost of a breakdown in the relationship is bad practice in any organisation, so be careful about which motivational strategy you use. 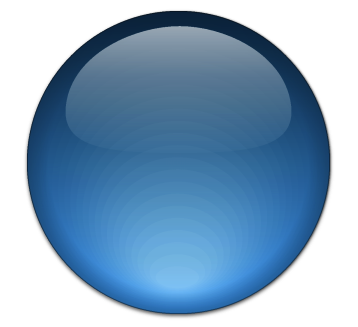 That takes us to the final part of the information journey, your brain will filter a huge percentage of information. Only a fraction of the initial information will make it to this rational part of your brain. The newest part of the brain is called the neocortex. This is what makes us so different from the rest of the animal kingdom and why the human brain is considered to be the most complicated thing in the known universe. 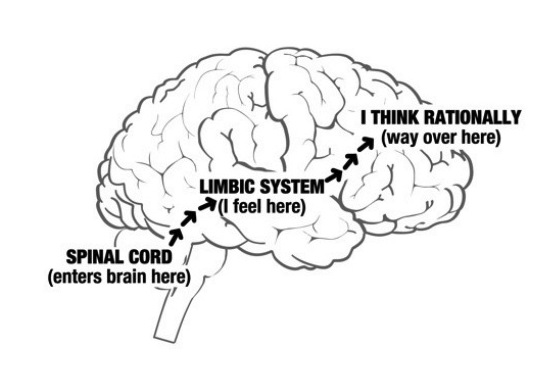 The neocortex is responsible for logic, analysis and rational thought. 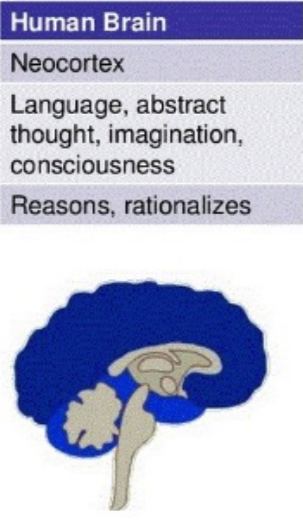 It also controls emotions. Although i the monkey brain creates emotions, this is where they are managed. The monkey brain has no ability to use language, it is the neocortex that processes language for us. The neocortex is capable of processing huge amounts of facts, stats and data and will use logic and reason to sift through the mountains of information available to it. For this reason, as a communicator you want all your messages to get to the persons neocortex. This way they have the best resources of their brains at their disposal to make the “best” decision given the circumstances. 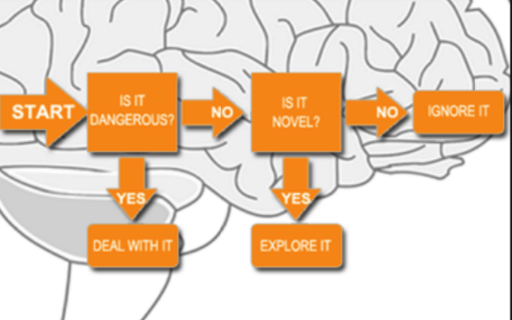 Unfortunately, because of the way the brain has evolved, and due to the fact that information must be processed sequentially starting from the bottom part of the brain and moving eventually to the top, it can be very difficult to get a message where you want it to go (the neocortex). When we communicate we often spend a great deal of time trying to solve our problems and have a good understanding of them. This means we tend to send our communication in a language that has been thought up by our own neocortex and because of this, it will be easy for another neocortex to understand. The only problem is, our communication doesn’t even get past their Lizard Brain and then the whole cycle of failure starts again. No matter how you try to motivate employees, they will certainly fail if you cannot even get your message past the lizard part of the brain. If you want to be more successful in your communication in how to motivate people you will have to broaden your approach and learn how to code your communication correctly. or your message, no matter how clever or right, is always going to be ignored by the gatekeeper and energy saver that is the Lizard Brain. No matter how hard you work or how passionate you are, you cannot motivate people to change without respecting the way the brain functions biologically and satisfying the requirements you need to successfully get your message through each part of the brain. So next time someone hasn’t paid attention to something you’ve have said, take a moment to consider it may not even be their fault! Their brain has likely filtered it out for them without them even knowing it! What part of the brain will be most difficult for you to communicate past? The lizard brain or the Mammal brain? 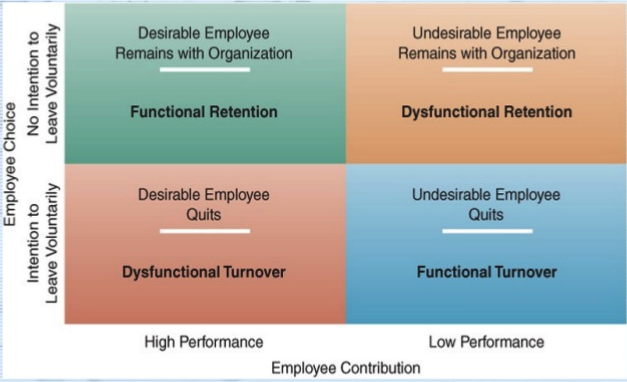 A key point of difference and often hugely underrated aspect of Managing other people is in employee turnover (the rate at which people leave your team). 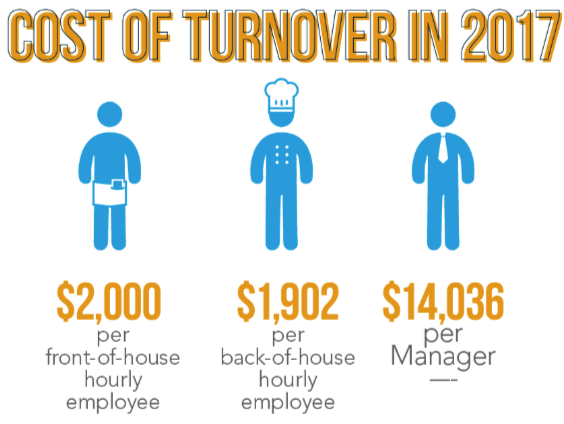 Employee turnover done wrong can cost literally years to your personal and your organisations development. If you’re serious about becoming an expert Manager/Leader then you need to retain your best staff. 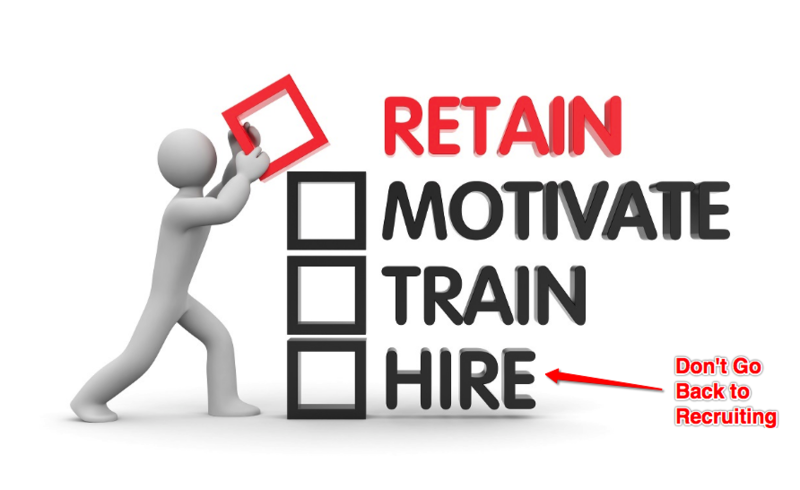 This part of the Management Training Course will seriously help improve employee retention by avoiding common mistakes that lead to higher staff turnover and give you some killer tips and strategies that will actually increase how long you retain your employees. In order for you to be successful, the people in your team also need to be successful. So, what do you do when you someone has bitten off more they can chew? but just can’t pull it together when it comes to executing their job role. People being on over their head is one of the main reasons good employees. Unfortunately, very few people have the self awareness to recognise when they are in this situation. Something much worse than this is the pressure people put on themselves to always do “well”. When it comes to expecting too much of themselves people are truly awful for this with the totally unrealistic expectations of what they “should” be able to do well. In fact, we’ve actually lost more people from our own teams for this reason than any other reason. These were good people that clearly cared and worked hard, we definitely didn’t want to lose their experience and begin an expensive and time-consuming training program to rebuild the experience we’d lost. This was made even worse because they were the exact sort of people we enjoyed working with and wanted to work with in the future. We should clarify that the people we’re referring to would not say these are the reasons they have decided to pursue new careers and that’s a big deal. We’ll cover how we discovered this shortly. The simplest way to explain this is to look at a job/role or even an individual skill or task and imagine that there are a certain number of things you must be able to do to complete this to an acceptable level. For example, to be able to do that job well you need to be able to do 50 things. 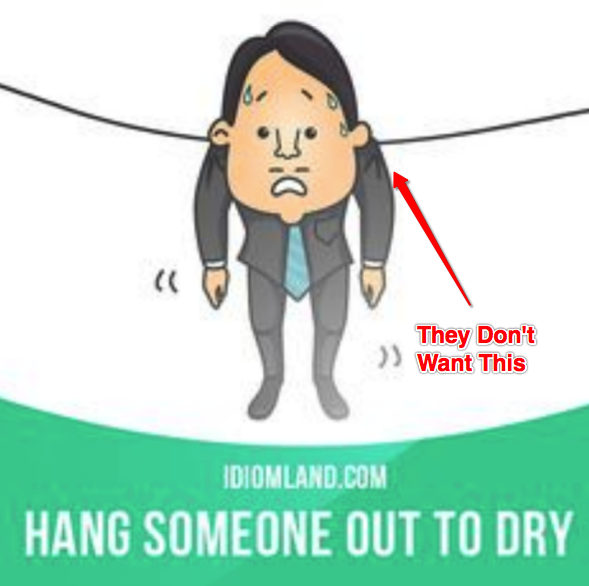 If someone needs to be able to do 50 things to do that job well and they can do 60, you can confidently say that this person will be a consistently good performer. 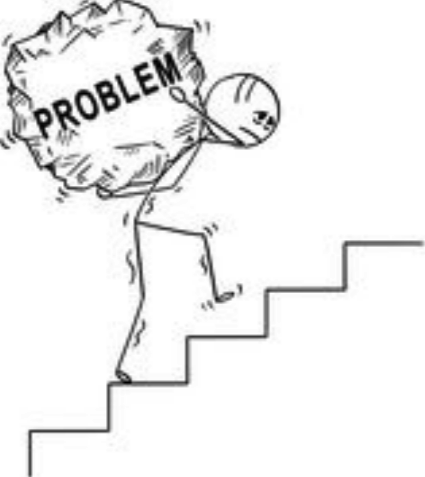 However, the problems start when people fall below that level. So let’s take the same example of 50, but this person is only capable of completing 45 things. No matter what the person does they will always end up with 5 parts of their job not being complete. They work really hard, they want to do a good job but 10% of their job is not getting complete and they are having to either outright leave things they should do or severely cut corners. This is not good for their own morale and it isn’t good for their boss either, no Manager or Leader wants people that leave parts of their job for the boss to do. Another possibility is that the job does still get done to an acceptable standard, if you are wondering how this is possible. 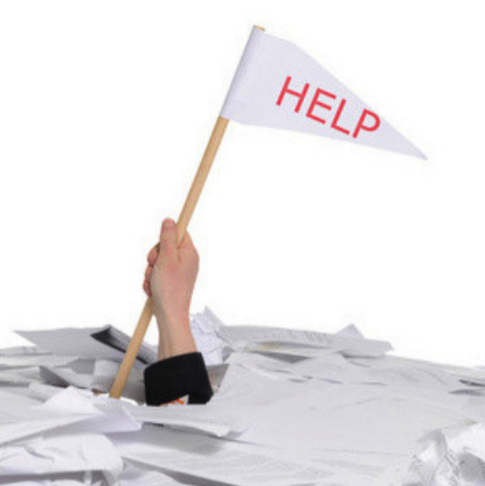 What do you do yourself when you fall behind on a deadline? You work even harder and you put in more hours to make sure you hit that deadline and that’s okay because it’s a short term effort you put in. That’s what they do to, only it isn’t short term and when people rely on hard work to do the “basic’s” of their role that’s a serious problem because it become a habit they rely on every single day. In short they are working incredibly hard everyday to do an average job. 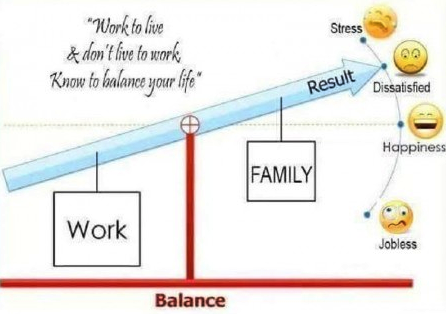 The work life balance is listed as one of the top reasons people look to move careers, for this reason you should never view it as okay for members of your team to just scrape results from hard work alone. For sure, being hard working is a desirable trait for an employee to have but relying on hard work alone is not sustainable in the long term and you will eventually be rewarded with their notice for your lack of effort to resolve the issue! Earlier we explained that the people that we have had leave our own team didn’t list the reason as being over their head. Like you, we’ve always taken the reasons they gave us as being true and wished them good luck in their new career. Sadly, a colleague who previously worked in one of our teams died very unexpectedly. At the wake we had 2 unexpected encounters with people who used to work in our teams previously. It had been a few years since they had decided to move on and we got chatting to them, we were keen to learn how they had got on and what life was like working for different organisations. As the conversations continued we could see a clear difference in the attitudes between each of them, one had taken a role much reduced in responsibility and despite having to work more days than he did previously (after quoting work-life balance as the reason for leaving- lol) he was extremely happy with his new job. The other had taken a similar role with a slight pay deduction (he cited leaving for Career progression as his reason for leaving). However, eventually, after a few drinks, he relaxed and talked openly about how unsatisfied he was in his role and told me he was now looking for another new job. There was a lot of hustle that evening so at the time we didn’t think much about it, but the next day we started to play it over and talked about it. If the guy was capable of doing 60 things when he only needed to do 50 he would have got a promotion for sure. In his case he explained the gap in his ability to do the job by using excuses. These mainly consisted of blaming changes the organisation made that were preventing him for achieving what he was supposed to do or blaming others in the team (whose performance he was responsible for) for not doing a good enough job. Now, just to clarify he was not an underperformer, the entire time I worked with him he got the job done to the level the company expected, it just wasn’t done in the comfortable way you would want to see before increasing someone’s level of responsibility. At the time both people worked for us our business was growing fast with lots of opportunities, the guy that quoted lack of progression wasn’t lying, he wasn’t offered progression because he just wasn’t ready. And now he had taken a similar level of responsibility and even though it was a completely different organisation in a totally different industry he was having the exact same challenges and sounded exactly the same as he did previously. He had literally just taken his problems with him to his new job. He needed to knock it out the ball park but just couldn’t. It wasn’t a lack of effort he didn’t have the skills needed to do it. That explained 1 out of the 2, but what about the other guy. His situation looked totally different, he wasn’t chasing rapid progression he said he wasn’t happy with the work life balance but then confessed to be working even more hours in his new job then in his old job but was clearly much happier. Discovering this was huge, just by us having an awareness of this has significantly reduced our Labour Turnover, this has meant we’ve been able to retain our best most experience people much, much longer. It has made our lives much easier and we have been able to spend our time moving ourselves and our business forward rather than focusing on constant recruitment and training for the key positions in our business. Everyone likes a challenge but nobody likes to be in over their head and struggling for extended periods of time. It’s no secret that we all prefer to do the things we are good at because there’s a satisfaction in knowing you’re good at it we enjoy it more. This guy had gone from a job that he needed to do 50 things but could only do 40 into a position that only required him to do 30 things and this changed everything for him, even on the toughest day that job could throw at him, he could still get 10 more things done more than that was expected of him. In other words: He was now ALWAYS good at his job. This was a game changer for us, We had never been taught or thought to look at the way someone did their job or how much they relied on hard work to do it. Both of us and the organisation we worked for at the time were just content to have people that could get the end result. In hindsight, it was our lack of awareness of this that ultimately led to us losing 2 good people from our team. Thankfully lots of businesses are now wising up to this is, but there are still thousands out there that are not and it’s costing you personally your time and them a lot of money. Here are 3 steps you can take to help when you spot someone has more things to do than they are capable of doing. Always look for information that will help you establish how people are getting their results. People are proud and like to look like they’re not struggling so you need to use well chosen questions to ensure the information your getting is actually correct about the situation. If you’re still not sure speak to other members of their team you will get the information you need. If you find a situation where they need to do 50 things but can only get 45 done you know you need to give this your attention. This can be very tricky, no one likes to hear that they are in over their head and need some help to get them doing the right things. The most important thing here is to be respectful and reassure them that the reason you are only having this conversation with them because you care about their success in the future. This can be a worrying time for people so make sure you reassure them and they fully understand you have their back. The aim here is to reassure so they can make sound decisions, the experience is already unsettling, you definitely shouldn’t be aiming to make them worry about their job at this stage. It makes the whole situation miserable for them and can severely affect decision making. Michel Thomas was a world authority in the teaching of languages, he dedicated his life to teaching others and got so good at it that he could teach someone to speak fluently in just 5 days(and charged $25,000 for what he could do). Michel spent whatever time he needed to ensuring that the student understood the responsibility for any of the students failures were in fact his. One of the reasons he did this was the reassure his students and you can’t argue with his track record! As with all good coaching you should inform them you’ll give them some feedback on how they’re performing and schedule a follow up meeting after an appropriate period of time in the future. Coaching is massive topic and it is difficult to well, like most difficult things worth doing though, the rewards for becoming highly competent in coaching can be huge. We’ve spent years learning, practicing and teaching coaching, it’s brought us so much success for ourselves and the people we work with that we decided we wanted to share everything we knew. Everything you need to know about coaching no matter what stage of your business or career development is at. 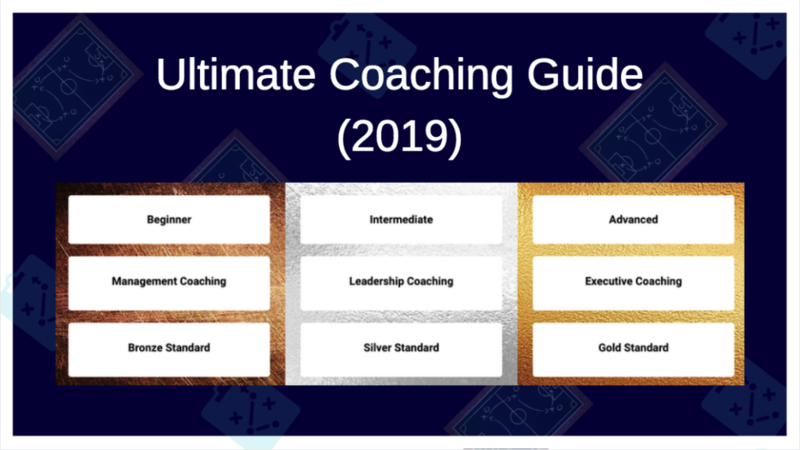 It took months just to collate the information for the guide, we put tonnes of work into it and it’s a fantastic coaching resource. Step 4 – Be realistic! As well as coaching them to be realistic about their own expectations of themselves, you also need to be realistic about the outcome of the coaching. 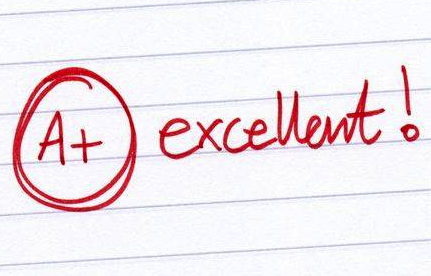 If you are a proven high quality coach that has experience successfully coaching people through the exact same challenge in one go then it would be a fair expectation to do it in one go. However, most of the challenges we have to overcome are different in some way in each case and realistically you are going to get a slight improvement rather than an instant fix. It will immensely help them manage their disappoint and likely you manage your frustrations if your expectations are realistic to start with! Both being happy with a series of small improvements is a much nicer working environment than you being frustrated and them feeling like a failure for the entire time it takes them to reach their longer term goal. 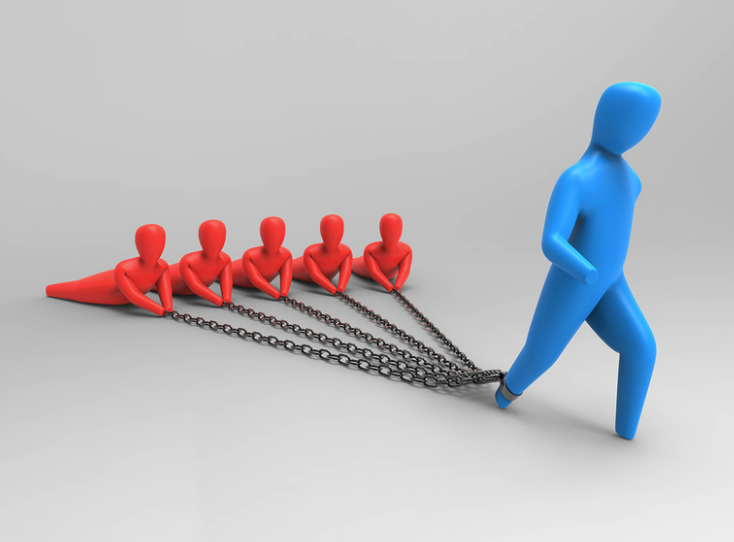 Executive coaching is a very specialised skill, although most businesses are still content in getting results anyway they can, the pressure to be responsible is constantly increasing in the form of ever larger penalties and without a doubt hitting the bottom line of any organisation gets the attention of the big wigs very quickly indeed. Now is the time to learn and practice these skills and increase your awareness of these common issues, in a few years time when business begin to value the leader/manager that can get the job done the right way, it’ll be the people that have put the effort in now that’ll get to cherry pick the opportunities they want. The last section of these Management Courses is about protecting yourself in case of tough times and being ready to take advantage of opportunities to grow and develop your business or career when the going is good. To do this you need to succession plan. 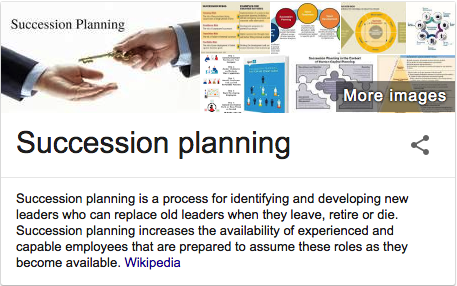 Good Succession planning is one of the most rewarding practices you can do for your team. It ensures that when new opportunities come up your team members can take them as there is always someone ready to step up into their position with minimal disruption to their Department/Section. You may have seen or even experienced it yourself. Someone was good enough for the next position up but couldn’t be replaced so they had to stay where they were (tragic and unnecessary). When you’re the best person for the job and you’ve worked hard to climb the ladder, it can feel like others less experienced than you are getting ahead unfairly through their own incompetence! Another benefit from well implemented succession planning is that the gaps between different positions are much less, this means that there is a lot less disruption for you when people do get promoted or leave. Good performing employees know when they are doing well so they are happier, poor performing employees are told in a clear way so they understand they are not fulfilling their role. In turn this transparency tends to filter back up. 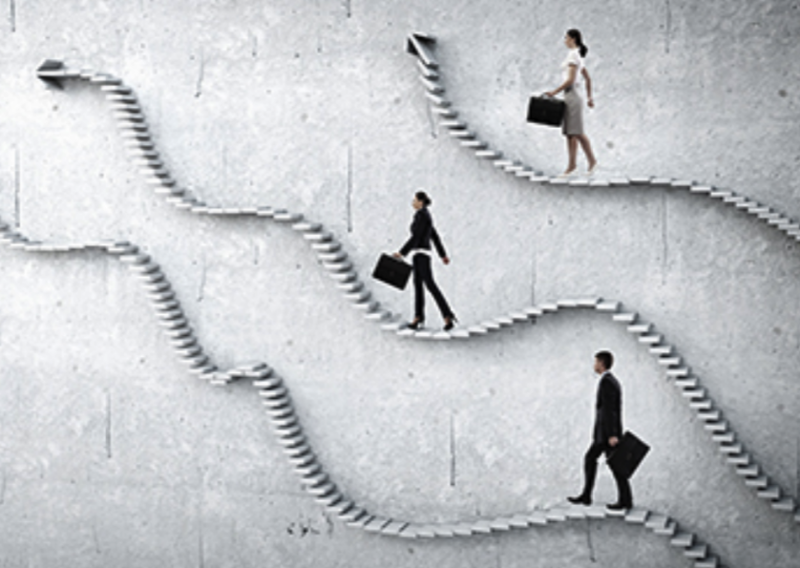 Managers and Leaders know when their people are not satisfied and are likely to move jobs. It’s easy to see the advantage of knowing 2-3 months before someone hands in their notice. This makes it very easy for skilled succession planners to stay ahead of their mediocre succession planning peers! Ants are the ultimate achievers, they are known for being some of the most industrious creatures on the planet. They are constantly busy. From dawn to dusk, workers go about their specialised jobs – looking for food, caring for their young, cleaning the nest and guarding against threads or invaders. 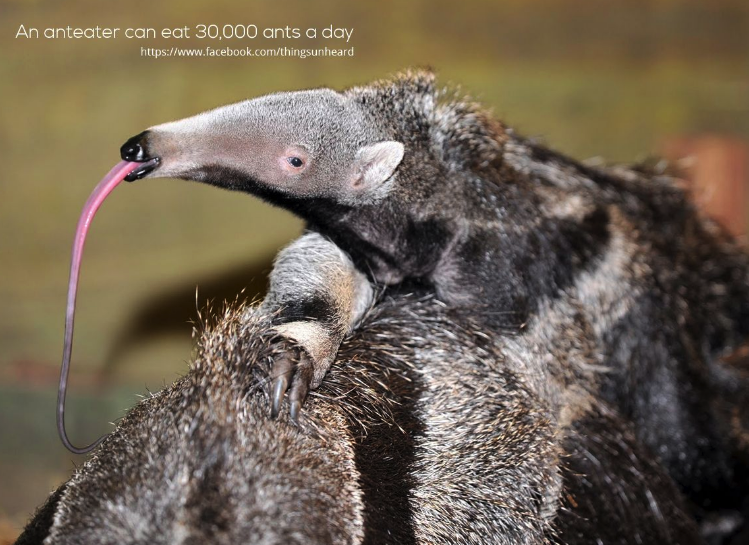 The largest ever colony found contained an estimated 306 million worker ants! (The population of London is estimated at 8 million). That nest had a headcount 38 times larger than London. 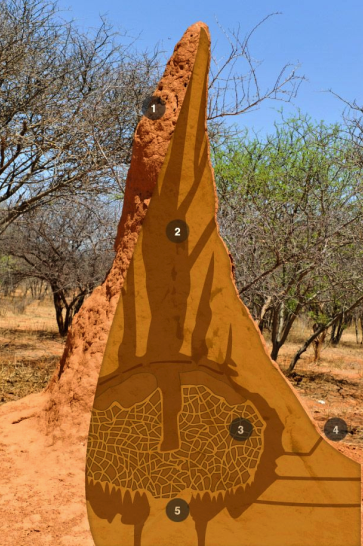 Can you imagine the infrastructure needed to build the nest, feed, create sanitary infrastructure temperature control and continue to produce ants at 45,000 eggs per day! They have achieved the ability to build, organize and plan through pure evolution and are the only other creatures (other than humans) on earth that use farms for food. 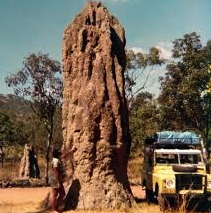 It is estimated they’ve been around for 120 million years, imagine what your team would be like if you could take advantage of the lessons ants have evolved and could succession plan your team as well as an ant does it’s colony? What Happens to Lazy Ants? If you’re like me you probably think it is they get eaten or something gruesome like that. The answer I got was very interesting and NOT what I expected at all. We’ll get to that latter though. During this experiment a number of new and exciting discoveries were made. The similarities and possibly the improvements organizations could make by learning from ants could strangely be huge. Scientists found that even though each ant can be viewed as a single universal unit of labour, it was discovered that some ants had more specialised jobs than others and also some ants were considerably more active than their counter parts. In fact it was found that an average of 40% of ants were “lazy ants” and 30% of the Ants did 70% of the work. This was interesting, it was the complete opposite to what I expected. I thought an ant colony would be a finely tuned machine of hard working ants at their maximum capacity, after all they seem to be so productive! The ants have evolved this way, that is to say that the ant colonies that did not have “lazy ants” have either been out competed by the colonies with lazy ants or have gone extinct. That means it has stood the test of time and clearly works, but why? Now is a good time to review my original question. What happens to lazy ants? Nothing they are a purpose build-in design function of an ant colony. 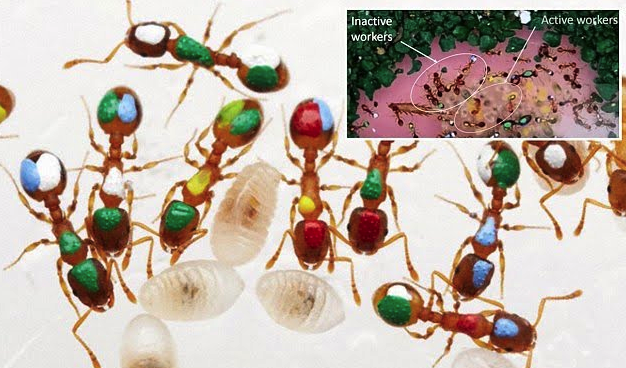 This finding puzzled the researchers also, so they continued to perform their experiments to see if they could work out why an Ant Colony would have evolved to deliberately have so many workers working below their capability level. Then the researchers removed 20% of the lazy ones from nine colonies to see how that affected activity levels. The researchers then removed 20% of randomly selected workers, active and inactive, from six colonies. So even after the engineered disaster of removing 1 in 5 ants from the colony including the active worker ants, within a week the remaining ants productivity was back to where it needed to be to run a healthy colony, effectively hitting the KPI’s of the missing ants. Any modern manager or leader would be impressed. Some tasks, such as egg cleaning and larval care, are labour-intensive. When the hard-working ants performing these tasks become tired and take a break, others take over. If no one tends the eggs, they could become infected with bacteria. In this section I will explain how important these lessons are and how they translate to successful people and thriving organizations. But first? Succession Planning Training, coaching and people development are now extremely expensive to do, so why spend time and money you don’t have to? The ants have the insurance policy of the “lazy ants” to step up as a reserve force in case of catastrophe, people and organizations that succession plan well also have the same benefits. In an ant colony the seasons can dictate the required workload, if there is a lot of food available but there is a short window of opportunity the productivity needs to increase to make the most of the opportunity while it’s available. Another way of looking at succession planning is to consider the organization or department as an elastic band and as the opportunities to grow develop the band stretches further apart. If you always insure the band can stretch further by investing in making it thicker and longer you can continue to grow your business. If you don’t invest in making the band bigger and thicker the band snaps. This is why companies that succession plan well make so much more money than organizations that do not. 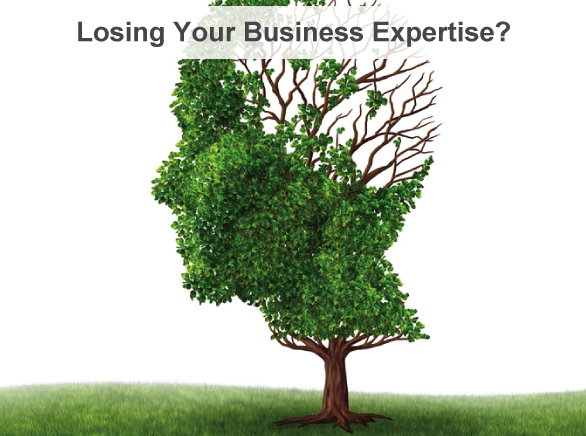 They can continue to grow when other businesses that are not succession planned hit their limit and lose control. 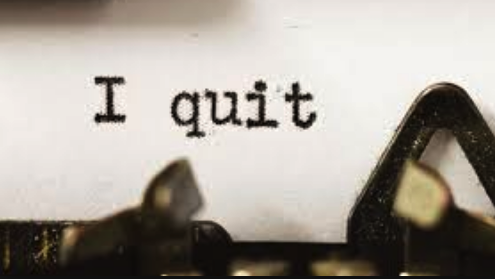 Another threat to companies and organizations is when experienced employees leave unexpectedly. 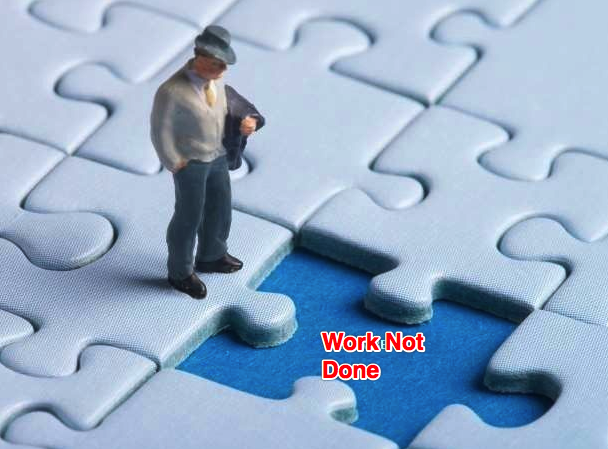 Big gaps in ability and in knowledge are a problem when people leave an organization, it can mean lots of important tasks do not get done to a good enough standard or worse not done at all. In the Ant study it was estimated to take about a week for an ant to learn a new skill before it became productive at the new task. This seemed to correlate with the 1 week disruption caused from removing the “active” ants, it appeared to take a week for the “lazy” ants to learn the new tasks well enough to get the productivity of the colony back on track as a healthy colony. In human organizations it doesn’t take a week to train people, it can take years for people to learn the skills they need to do a role to an acceptable standard. There are examples where entire industries grow unexpectedly, it then takes years to fill the demand and companies end up paying a lot of money while they are waiting for enough trained workers to enter the market. Succession planning can give us a head start or even an instant fix when people leave if it’s done well enough, but it’s only as good as your ability to estimate where demand will be in the future. For this reason it is good practice to balance small gaps across your entire team rather than focusing on just one section and putting all your eggs in one basket. This way even when training takes years you can either complete the training before you need it done or get most of the training complete so the person needs only a small amount of guidance to do the job until they build their experience. 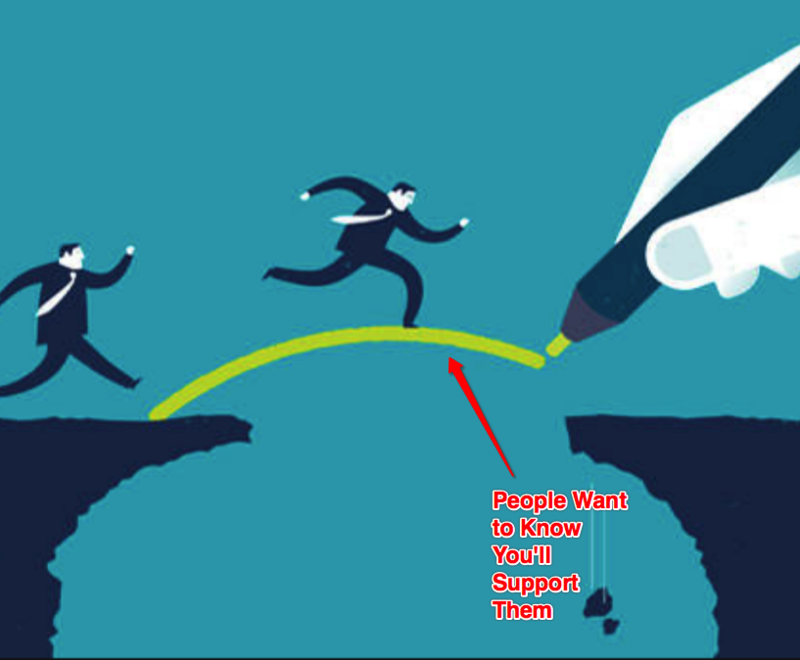 If the gap is too big they simply won’t be able to do the job or will need significant support from others costing the organization time and money, it will likely also reduce productivity. You can keep multiple people improving at the same time so that people are ready to take more responsibility when you need them to. The last part of succession planning is one that ants seem to do naturally but most managers and leaders avoid like the plague. Remember earlier we went through that ants get a week of “training” by following another ant doing that job. It was also found that an ant that wasn’t productive enough after a week was then given another less specialised job. The point here is that no ant is allowed to do a bad job in the role they are in they have their responsibilities reduced until they can do the job to a good standard. When people approach us, unfortunately too often we see the complete opposite of this. People are allowed to continue in positions doing a sub standard or even an outright bad job. A point to note is that these are usually not bad people, they want to do a good job and they do their best, it just isn’t good enough. 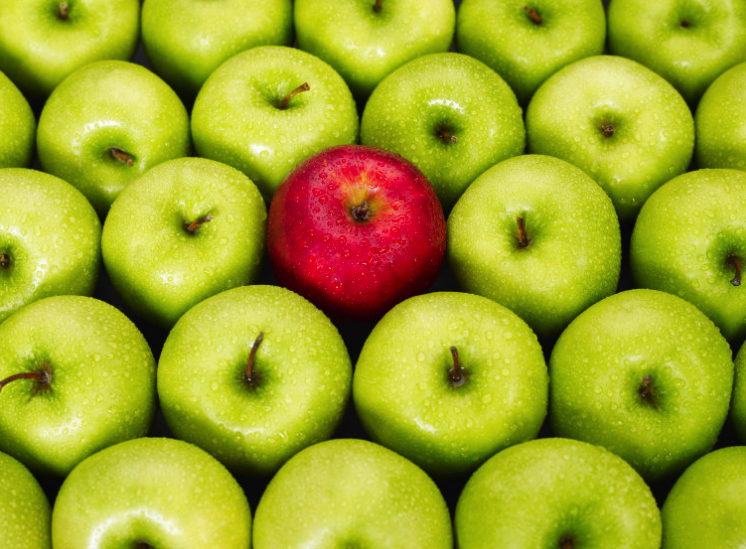 They are easier to spot, they stand out quite clearly against their peers. 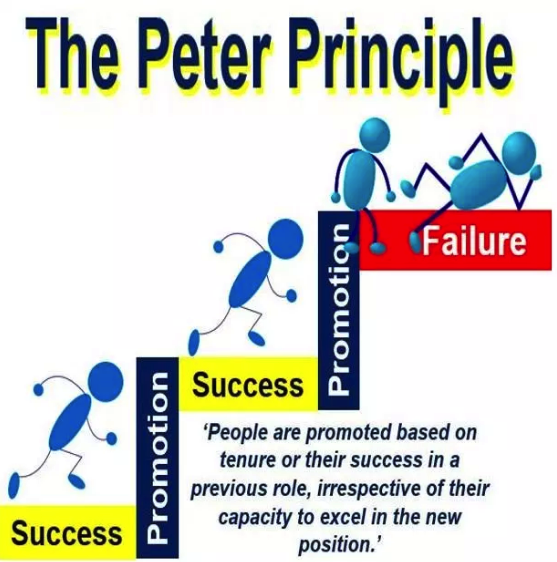 This means that an individual will continue to get promotions or increases in responsibilities until the number of things they need to do becomes greater than the skills they have to do them. At this point they can no longer do that job well anymore and they have reached their level of incompetence and they will likely be stuck in that position for some time. 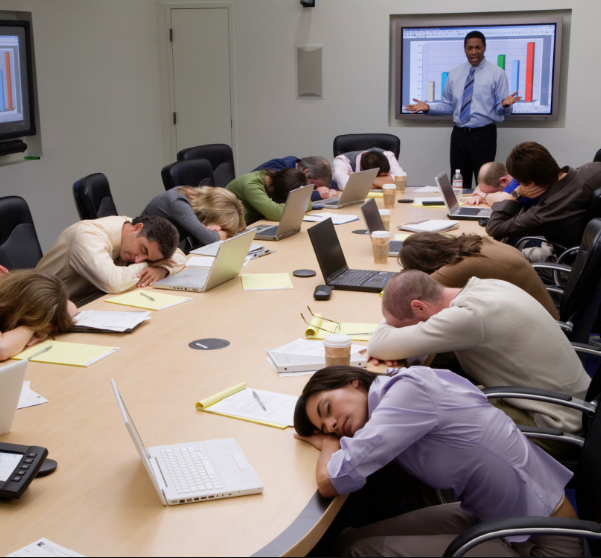 Managing under performance can be a tricky task but it need not be shied away from. From our experience the longer the person is left in the dark about their performance the harder the task of being honest about their performance becomes. That means the longer you leave it the harder it gets. Jack Welch is a hugely successful, legendary CEO. Under his leadership he took GE from $25 billion in sales to $130 billion and moved profits from $1.5 billion to $15 billion. In Jack’s book Winning he stated that his one regret was not dealing with underperformers sooner. When all is said and done it comes down to having the courage to say what needs to be said. 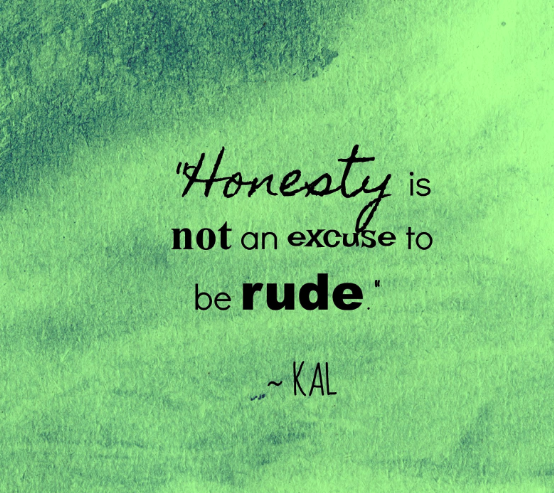 Blunt honesty without regard or consideration for how it is affecting the other person is a bad practice, it has a very negative impact on them, this makes the task of being honest more difficult for you. Managers often see that they have a duty to be honest but things should start small and escalate, no one likes the surprise of finding you’ve been with-holding information about them for long periods of time before bringing it the their attention. When people struggle the instinct is to mask how difficult they are finding the task. If your team see’s that you always treat people with respect and give them support when they are at the most dangerous and low points of their career they are much more likely to approach you sooner when they are finding something difficult. This makes it far easier to fix a problem before it is too late. Nowadays, being a Manager or Leader is tough. There has never been so many restrictions on how the job or business needs to be done. We’ve gone from walking a nice wide platform to walking a knife’s edge. This isn’t necessarily a bad thing, it just means we need to be better than the people who did the jobs before us. There are still many improvements to be made in Management and Leadership science. In the meantime there are literally 100’s of proven leadership and management tips and techniques that have stood the test of time already available to learn and use right now. These improvements can literally 10X businesses and careers but they are yet to make it into mainstream world of organisations. It’s a great time to start developing your competitive edge, but it takes work. A little bit of focus learning the right things now will pay off for years in your future. We hope these Management Courses help you improve your leadership and management skills. Now we need to hand it over to you. Or maybe you’d like to suggest other topics you’d like covered? Either way, leave us a comment below right now.